After a much-needed break, I’m almost ready to dive back in. I have eight precious days of summer vacation left. So between all the last-minute appointments for things I’ve put off all summer and the final fun days with my kids, I thought I’d get myself back into the groove by posting one Back-to-School idea a day. We shall see how this goes…. At the beginning of the year, we all want to know more about our students, gather important phone numbers, e-mails, and information. There are many ways to gather such information: a Google form, a paper questionnaire, office files…. For years, I spent a lot of time perfecting my letter to parents about myself. It always ended up sounding like a mash-up of a resume and a letter in a Christmas card. Who was I trying to impress? After about 10 years I education, I learned to keep my letter short and sweet. This will be easy enough for you to type up in less than 5 minutes. If you are really pressed for time, I will attach a word document at the bottom that you can customize in a matter of minutes. As a parent, I feel overwhelmed by all the paperwork that comes home in the first few days. So, I only ask for the things I really need to know! Short and sweet and non-threatening – kind of like me! 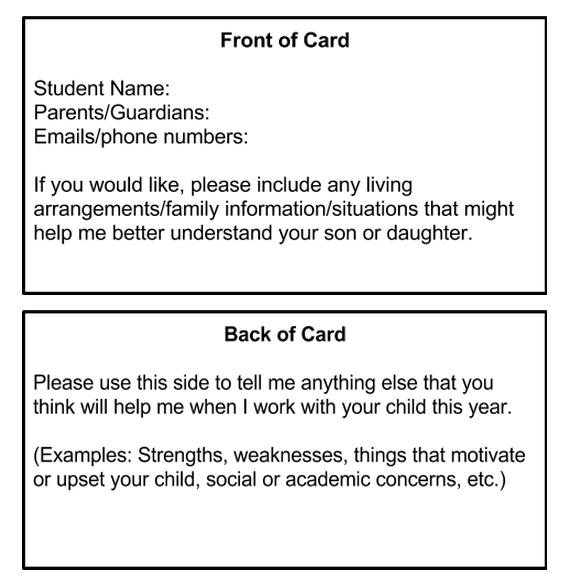 How do you communicate with parents at the beginning of the year? What information do you most want to know?